The cold spell didn’t last long and as we move into January it is unseasonably dry and warm at 12o with the colonies making the best of it by keeping busy and gathering pollen and water where they can. Last year if you recall we had already had three heavy snow storms by this time. Poor Austria presently under several feet of snow, the worst in the last 100 years they say. 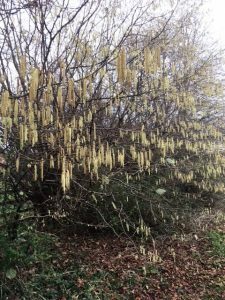 The Hazel catkins, with light green coloured pollen, are in full flower and the worker bees have been examining my winter flowering Jasmine, but I’m not sure they actually get anything from them at this time of the year. 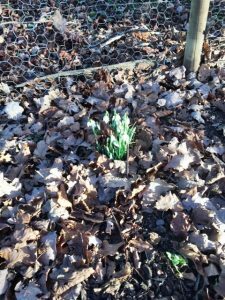 If this weather keeps up the snowdrops that are already up will be producing a dark red coloured pollen and the crocus close behind with a light brown or sandy coloured pollen. These observations at the hive entrance are all so important giving positive signs of a live healthy colony bringing in Bee Bread (pollen) for early consumption. But don’t get complacent, heft that hive and if in doubt put on a slab of Fondant just above where the cluster is located in the Brood chamber. 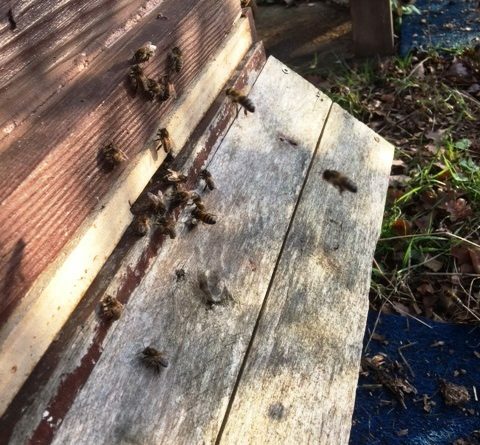 I use acrylic crown boards on some of my hives in the winter, which have a three inch eke attached so a quick look under the roof can help to show me how winter consumption is going. As you can see from the following pictures one is quite happy and has plenty of Fondant to go, whereas the other needed a top up! 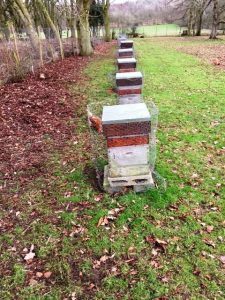 The Association was recently donated the contents of a retiring Beekeeper’s Apiary from Mickleton with one live colony all in Langstroth hives (Note – sale to Members later in season). After Chris and I recovered a car and trailer load of kit we decided to treat the colony for Varroa by the ‘Gassing method’ using the home made device he has constructed (skilled engineer in his day) as they’d not been treated in the Autumn. 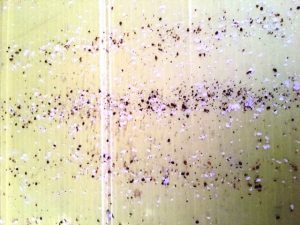 The result is shown below with a big fall of mites that just keep coming, so the colony will probably need another dose – sorry Chris! 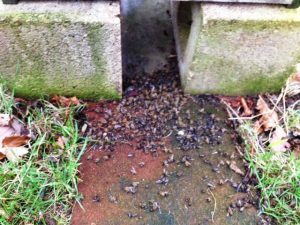 How did you treat your colonies for Varroa this Autumn/winter because if you didn’t, this is what could be lurking in your hive ready to reinfest all a-sundry as those feral colonies will do this spring. 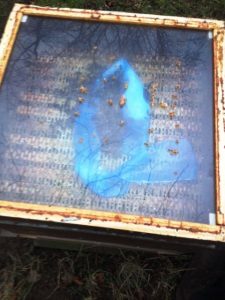 But those who treated as advised – well done, but keep an eye on any droppings on the Varroa tray and get that magnifying glass out to see what you can see amongst the bits of wax, fondant and other debris that drops through the screen. Please don’t worry if you see a lot of dead bees thrown out at the front of the hive, a bit like the ‘Black Death of Medieval times’ those that have died from disease or just get old and worn out (thank you for just thinking that of the author) need to be disposed of to prevent the spread of disease and keep the hive happy and healthy. They do this in the spring or summer but normally take the bodies a little further afield so we don’t see the pile at the front of some hives. At least my hens have a good feast scratching around – eggs taste nice too! Woodpeckers have plenty to eat at present but I’ve still put up my defences to make the place look like ‘Fort Knox’ – well Woodpecker proof at least. The retired Beekeeper at Mickleton had some lovely examples of what Woodpeckers had done to his hives in the past. Chris will show at the next indoor meeting. In addition to Langstroth hives the Agricultural Engineer son in law had built some marvellous steel framed wire mesh protection which I doubt a Honey Badger would get through (I know wrong continent) – all for sale later. As we’ve had no hard frosts to speak of in our region any wax moth grubs will have survived very well so far this season. 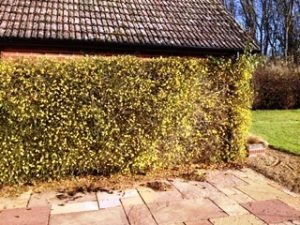 When the next Hard Frosts are predicted all my Brood combs and super combs I protected so well from the mice in my Bee Shed will be placed outside and let nature takes its’ course. Spiders also used will be fine I’m sure. Last but not least, what are you going to do if you find a colony has died out in the next couple of months? Please DO NOT leave the other colonies in the vicinity to ‘Rob’ it out and spread the disease back into the cycle of destruction that will certainly occur. Seal the hive and then decide what you intend to do. 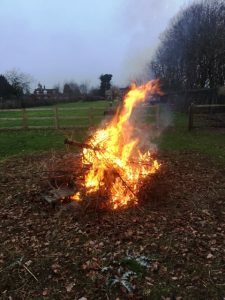 More advice next month or if it’s that smelly and bad just burn then straight away on the bonfire. February is a good month for stocking up on bargains with all the Manufacturers and the Spring Fair at Stoneleigh is not far away. Hopefully there won’t be two foot of snow this year! 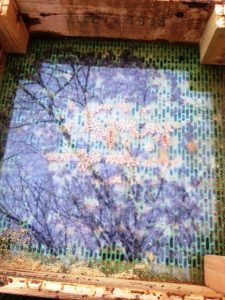 Keep your bees well fed, dry and warm ready for the rush of spring.